Stanton Arts was created around about 2000 when veteran portrait artist Stan Stanton hooked up with business woman and Chinese charmer Jasmine Kaniuk. Stan had been eking out a living with caricatures and portraits in the Atlanta area. Jasmine had been selling glass-blown items in Wisconsin area malls. The two entrepreneurs were complimentary opposites, each one's strengths covering for the other's weaknesses, like Yin and Yang or Ernie and Bert. In 2000 after one customer's chance suggestion, Stan and Jasmine took an enterprising trek to Myrtle Beach, SC. breaking free of the gravitational pull of Six Flags in GA. Myrtle Beach was a friendly environment and a logical place to do business, with its millions of tourists anxious to spend money. 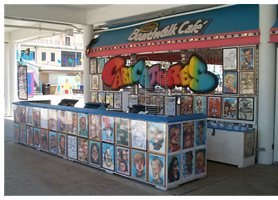 Finally they took a chance and planted their first caricature booth on Ocean Boulevard at the Myrtle Beach Pavilion in 2002. Through all the happy years since Stanton Arts has expanded to other prime locations in Myrtle Beach, as well as several big state fairs up and down the east coast. Max: Integral to the story is artist and manager Maxim (Max) Tyutyunnikov, without whom none of these enterprises could get off the ground. He's like our Commander Data, but without the dance moves. Max came to Myrtle Beach from Kazakhstan in 2008 on a student visa; and after graduating with an architecture degree returned to become a US citizen. Max's love for caricature shows in his work. Over the years Max has built quite a following of loyal customers who are continually adding to their own private caricature galleries. In addition to being a great artist, he also does a wide variety of tasks for the company. He doesn't suffer fools, but prefers to make us suffer-the Immortal Max T! The enterprise crew: Every year Stanton Arts hires and trains a team of young art students for caricature, many of whom continue for years as caricaturists or use caricature as a basis for other careers in art. But any who work here will retain our simple formula for success- the golden rule of caricature-- give every customer your best possible drawing every time, and you will progress from drawing to drawing. Personal artistic development on the model's dime--who can beat that deal? Fortunately many of these talented kids will get the caricature bug and return for more fun in the sun. Our philosophy: We have great respect for the caricature art form, even more than for fine art portraits. Caricature combines real world observation, with the world of imagination, and for that reason caricature beats portraits, photos, and copy machines in our humble opinion. We believe that to be done right, caricature should fall in between the two extremes of illustration and fine art, taking the best from both worlds. Obviously, no one on vacation wants to sit for two hours for a portrait; but also no one wants a two-minute marker sketch with no likeness. So our methods and materials are geared toward the fine art caricature, with a soft modeled look, a high degree of likeness, and in the target time of ten minutes. Uniqueness and cuteness will be exploited, but no negative vibes will be allowed. Our goal is to elevate the standards in the industry, and based on our substantial amount of return customers, we're succeeding. We want our customers to get excited, show their friends, and come back for more. Events/etc: For those who live in the Carolinas, our friendly staff of artists are available for birthday parties, corporate events, weddings, bar mitzvahs, etc. 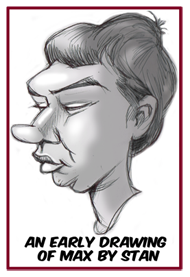 Always a big hit, caricatures are almost as much fun for the artists as for your guests. 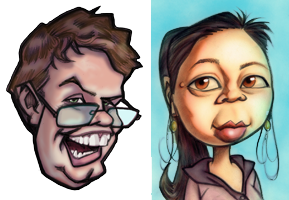 Another option is to have your caricature made by e-mail. See our orders page for details. Rest assured, no matter how you get your pictures made, you will get the very best from us.